Brief Synopsis – A small time Californian newspaper reporter gets the scoop of a lifetime, but will the act of following this story endanger him and his family? My Take on it – I LOVE movies about conspiracy theories, especially ones like this that are based (somewhat) on true occurrences. 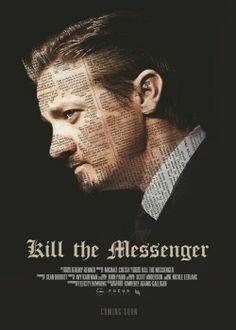 I was pulled in quite early while watching this movie and was so enthralled (and appalled) at everything this movie wants to tell us about Gary Webb and his biggest story. It’s always amazed me how once event in one’s life can affect so much that follows. This movie takes an article written 20 years ago and shows us all that in order to ruin someone’s reputation or save it so little needs to be completely proven because people will believe everything they hear whether it’s truth or fiction. Jeremy Renner once again has proven to the world how extremely talented he is as an actor and continues to excel at every role he plays. The rest if the cast is also top-notch which raises up the impact of what happens in this movie. The question will always still remain – What is mightier, the pen or the sword? Bottom Line – Great conspiracy theory movie based on a real event. Renner is once again amazing and should keep taking such risky roles. Very good supporting cast that lend credibility to the story. Highly Recommended! Nice one Rob. This is another that I’ve been wondering about but not heard much of. You’ve convinced me. I enjoy a good conspiracy flick myself. Nice review Rob, I’d never heard of this film until reading this review. I love a good conspiracy theory thriller so this sounds like something that would interest me. Great to hear that I could help vinnie. Hope u enjoy it and I cant wait to hear your thoughts on it! Thanks for the recommendation. On another note, have you seen any of my Bond reviews yet? Nice review, Rob. Jeremy Renner. Why is he often overlooked as a top actor? I agree, he’s solid in everything he does. I’m intrigued with this film–thanks! Yes he is. Tnx for stopping by and commenting Cindy! Enjoy! Sounds good! I really enjoy Jeremy Renner. Can’t wait to hear your thoughts on it Nat!